A couple of years ago, Denise Perreault shared her amazing beaded curtains with us. She also shared her creative inspirations and process, which I think you'll find fascinating. You can read about Denise in her artist profile. Well, I recently asked Denise if she would care to share an update with us, and I think you're going to just flip over her new work! Another way to keep up with Denise is to become her fan on facebook: Denise Perreault Bead Artist. 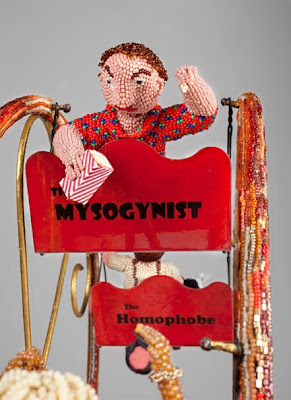 Denise Perreault has been concentrating on sculptural beadwork for the past year, completing both "Freak Show Ferris Wheel" and "The Men Eat First" from found objects in 2009. "The scavenger in me loves to find discarded items that I can repurpose into art," says Denise. 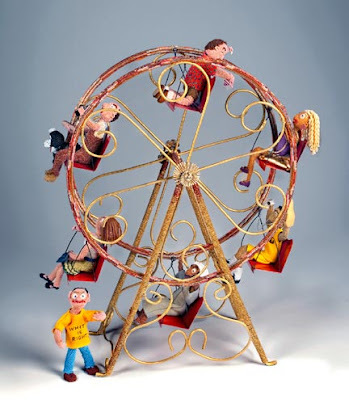 "It's satisfying to be challenged by a piece of "junk," -- like the iron flower pot wheel that inspired "Freak Show Ferris Wheel" -- and transform it into something beautiful, provocative, or humorous." frustration with America's increasing polarization. "The Men Eat First" (tallest figure 13" high), was inspired by the Indonesian folk art candle sticks given to her by a friend who was purging things during a move. 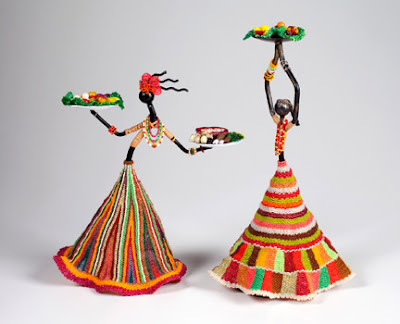 Instead of candles, the women bear plates of food, and their voluminous beaded skirts contrast starkly with their thinness. Here Denise comments on her time as a Peace Corps volunteer in a tiny Tunisian village in the mid-90's, where she struggled to abide by the traditional Muslim custom of the men and guests, like herself, being served the meat and choicest foods first, while the women and children ate whatever was left over. "Skinny old Pier One Import candle-holders," says Denise, "seemed the perfect cast-off to convey the injustice I felt towards that tradition." These pieces and others will be exhibited in a group show entitled "Rough Ruffles" that Denise curated for the Dairy Center for the Arts in Colorado for 2011.
always submit high-quality images, but to never take a show rejection personally." Denise is also busy writing free-lance articles for her local newspaper, as well as researching her family's French-Canadian ancestry as a 75th birthday gift for her father. Beautiful and thought-provoking at the same time. I love The Men Eat First especially with Denise' own back story.